Red Hook, the south Brooklyn neighborhood stretching below Atlantic Avenue to the Hudson River, is a place of contrasts. Sleek minimalist condos sit inside 19th century red-brick warehouses. The smell of salt water is halted by sewage reeking from pipes un-repaired since Hurricane Sandy. Construction cranes hum alongside dilapidated buildings. Wildly reviewed restaurants buzz just a few paces from the local bodega. One of the neighborhood's distinguishing characteristics is the open sky. The buildings are short compared to the city, especially across the river in Manhattan. The proximity to the water gives Red Hook the feel of a beach town, but definitely not a resort. It's just the kind of place artists and young urban famlies crave--cheap rent (until a couple of years ago), parks, plenty of real estate to renovate. Van Brunt is the main street running from Atlantic, a main thoroughfare in Brooklyn, to the water. I started with the Ice House and its neighbor, Bait and Tackle, the local watering holes and the places to find people who know Red Hook. Hometown BBQ sits at the base of Van Brunt on Reed, just across the street from Fairway market, a massive grocery store selling everything from quarters of beef to Brooklyn Kombucha. Around the corner from Hometown on Conover is the legendary Sunny's Bar, owned by the Balzano family since 1890 and currently run by Sunny Balzano, "The Grandfather of Red Hook." You can read about Hometown and Sunnys in my posts from last year. A new addition to the neighborhood is the Hometown Shack--where they smoke all the meat on wood-fired smokers. Two shipping containers handle a couple of smokers and a couple more sit outside next to the gravel yard. In the summer you can get your ribs and sit at the umbrella tables taking in the smoke flavored salty air. A few paces from the Shack Louis Valentino, Jr Park and Pier locals can fish while enjoying possibly the best land view of the Statue of Liberty in New York. The park and pier are named after a firefighter and parks lifeguard Louis J Valentino who lost his life while searching for wounded fellow firefighters. The lower Manhattan skyline stretches along the water, dominated by the new World Trade Center. I happened to be there on September 11. 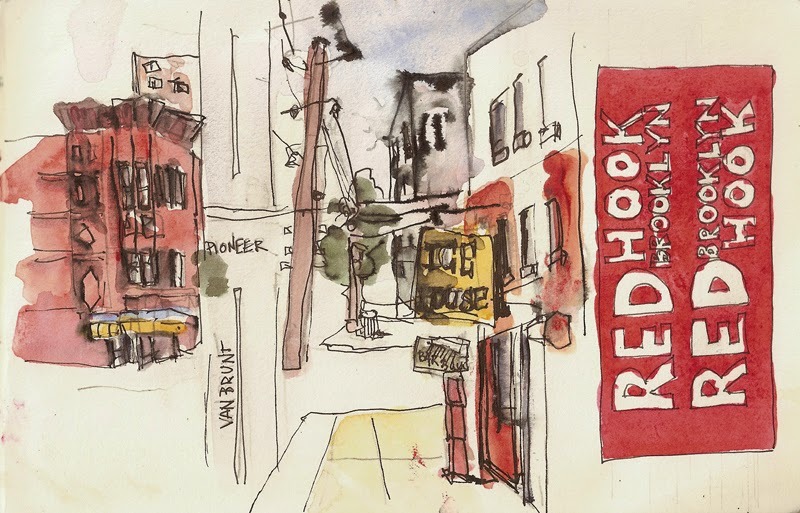 "If you ask an outsider what makes Red Hook special, they'll talk about the parks and open spaces, the waterfront views, the cobblestone streets, the great businesses, churches and agencies that creat the fabri of the community. If you ask someone from Red Hook, they'll tell you the secret: It's the people who live here." 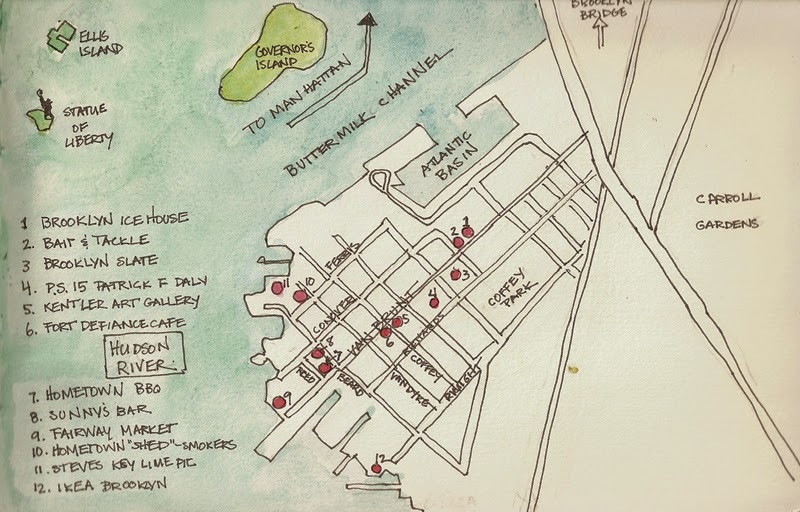 Jane thanks for the story and wonderful images of Red Hook... I think I need to add it to the list of places to visit next time I am in NY. It's a pretty interesting place with a lot of soul. Great job on capturing the area (lived nearby about 8 years ago). Jane, I have really enjoyed your posts about Red Hook. Hooray for the restaurant's success! Great post. When you visited why didn't you look us up? Would have lived to have seen you and maybe sketched together. I'll be there again and love sketching anywhere in NYC. 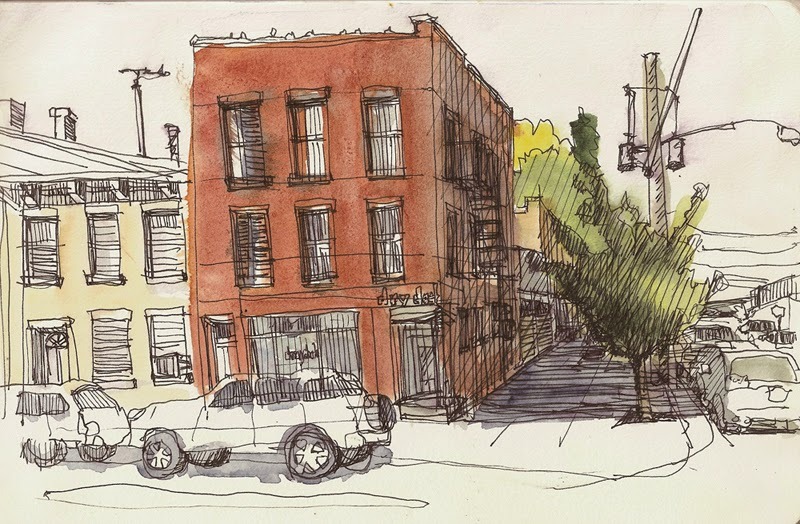 I've been getting to know Red Hook lately since my daughter and son-in-law now live there.